This is an A5 card. I love the sentiment, and played about with the fonts on my pc. The heart is from the memory box precious hearts... I just cut it off the bottom. The butterflies are punched, from Martha Stewart. and used one of my fave embossing folders for the background. 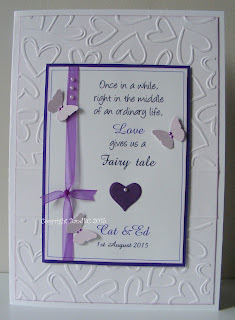 You have made a very pretty wedding card... love the sentiment.. thanks for joining in our 'use a punch' challenge over at Crafty Friends... hope you can join us again next time... good luck. This is gorgeous Vic, such an elegant design and wonderful sentiment. Love it! Glad you could join us at Get Creative Challenges. Just so beautiful Vic. Loving the embossing and white and lavender. Beautiful and elegant wedding card. Thank-you for joining us at The Crayz Challenge! What an elegant and classy card! 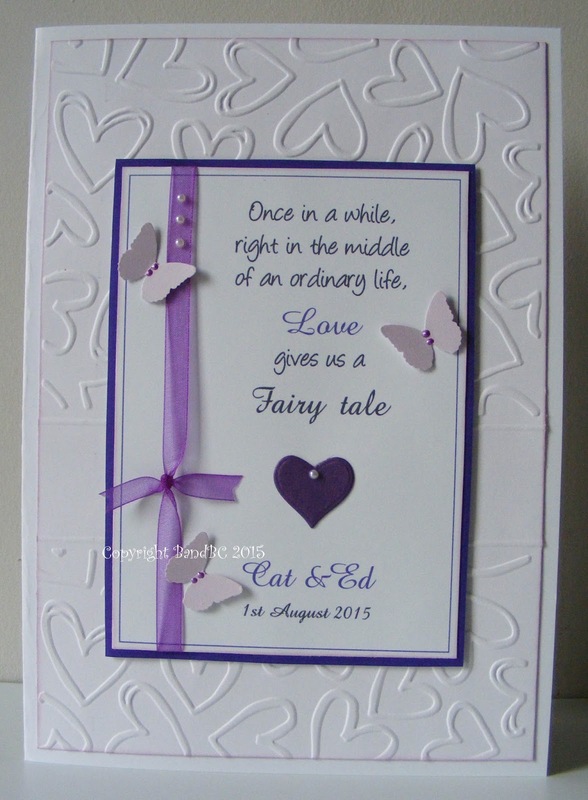 Love the white with purple and the embossing! Thank you for joining us at TTCRD this week! Lovely card! Thanks for playing along with us at Get Creative Challenges!